My friend Stephanie–classmate, running and study partner–and I met up at our usual hangout this afternoon for the first study session of the semester. 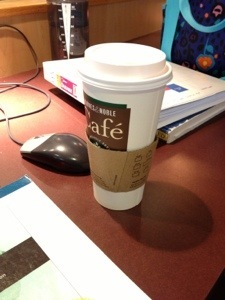 What you see is my super-smart lunch…or not. What this post should REALLY say is, “Holly runs on Dunkin’… Until she doesn’t.” An hour and a half later, I was in a sugar coma and craving vegetables in a bad way. I’m not normally a Subway fan, but at 3:30 and facing a Target run, I needed something. But, I digress. 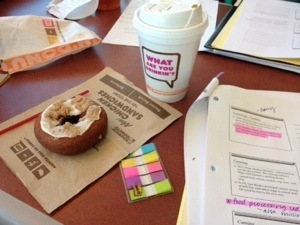 Poor snack choices aside, it felt good to be back in the study groove, in our booth, at our Dunkin’. *STILL working on the post about last weekend’s trip to Ohio… Enjoy this in the meantime! So, Friday after Christmas, Regina and I FINALLY (and I mean finally–we hadn’t seen each other since JULY) got together for a brunch date. Where did we go? 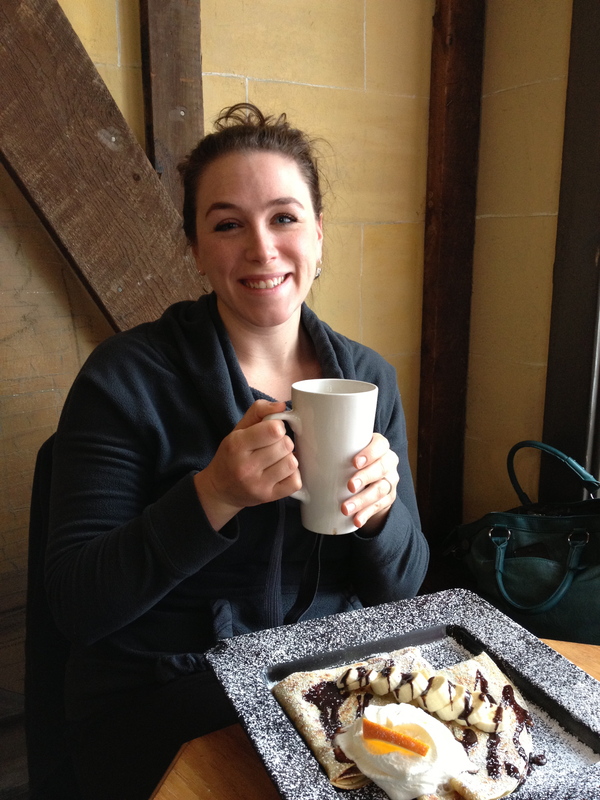 A cute-as-can-be little creperie in Buffalo near the zoo. Andrew and I had actually pointed it out before while driving by and remarked that it was a must-try. We ordered coffee first–a regular for her and a Vanilla Ginger Latte for me. I was all set to get a regular coffee (cheaper, fewer calories), but the word ‘ginger’ on the menu caught my eye and I couldn’t resist. 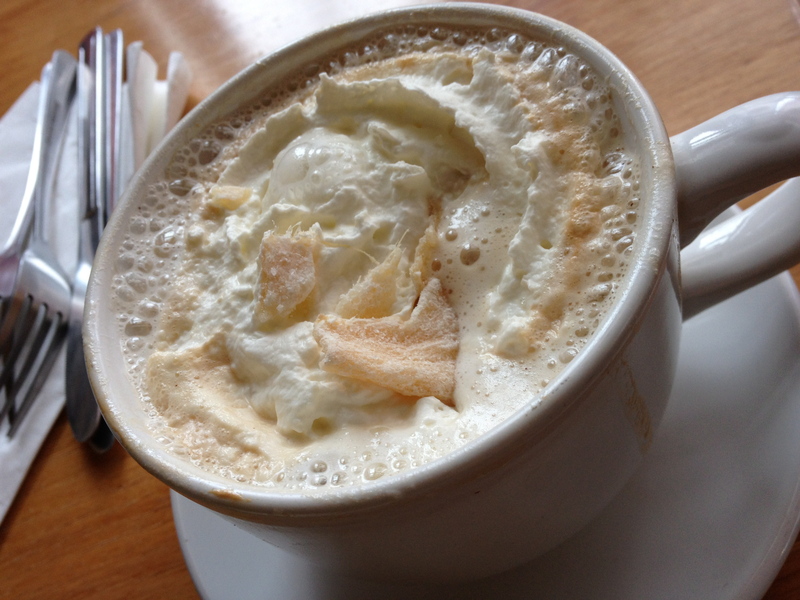 There was even a hunk of crystallized ginger in the mug! I would definitely get it again. Andrew is a huge crepe fan (who knew? ), so I’m sure we’ll find our way back there at some point. 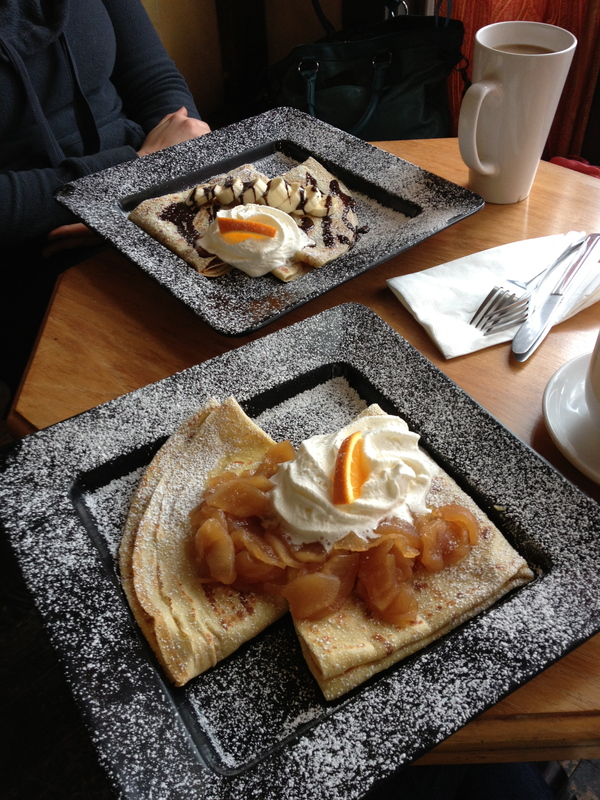 When we decided on our breakfast, it was a nutella and banana topped crepe for Regina and a baked-brie-filled, sauteed apples-topped crepe for me. Heavenly.